I have a confession to make, and I’m probably alone in this regard, but I am going to miss the Burger King in American’s terminal at LAX (it was closed earlier this year to make way for new dining options). Just as the Statue of Liberty once welcomed tired travelers to America’s shores, the T4 Burger King has often welcomed me back to the U.S. after time spent in Asia. Even though I would nominate Tokyo as the food capital of the world, think Sydney is an interesting food city, and recognize that China represents one of the world’s great food cultures, few foods can match the taste of a T4 Whopper after two weeks in Tokyo and an hour clearing Customs at LAX. Not even an ordinary non Terminal 4 Whopper. Maybe it’s the location, maybe it’s the circumstance, but foods delight like ‘Welcome back to the U.S.A. – T4 Burger King Whopper’. I mentioned this to a friend who spends a long time abroad traveling frequently between Mumbai and China for her job. She said that she looks forward to the connection in Bangkok just so that she can get visit Burger King. And the other day I read a discussion on Facebook about eating American fastfood when traveling abroad. One friend mentioned that he likes to visit the McDonald’s in each country he visits to see how the menu is localized for each market, and that it’s a great way to look a the culture from the inside. I thought that was a great idea. Thanks to a generous reader (Thanks Wissam! ), who won an earlier reader giveaway and is donating a Gogo Inflight Wifi code, I’m having a reader giveaway this weekend. When traveling to other countries have you (or would you) stop at an American fastfood restaurant for a little taste of home? I’ll have a random drawing on Monday. One entry per person. The deadline to enter is Sunday, May 12, 2013 at 11:59 PM Pacific Time. Sometimes when I get bores of Asian food, I head to McD. The problem is that most American fast food chains have different menus abroad that cater to local tastes. I’ve ordered draft beer at a McDonald’s in MAD (wouldn’t give it to me with the value meal though, I asked). Absolutely! Sometimes you miss it! I’ve gone to McDonald’s to look at the food, but also as a student it’s STILL some of the cheapest food around (even with the inflated prices in Europe) and the free WiFi offered even outside of the US is a massive help. Also, McDs in France offer a can of Heineken for the same price as a soda with their combos. You can’t find that kind of deal ANYWHERE. I stop in sometimes not because I ever eat in them at home, but because I am curious as to how it’s varied overseas, and what the reception by “foreigners” is to “American” food. I like to try food from that country so try to avoid american chains and especially fast food. I will try as much local food as I can. However, I would try something that we don’t have in the USA McDs. Taiwan McD has what is called “egg hamburger” on their breakfast menu. The difference is the buns are pretty soft and I never had similar buns here. They also have hot chocolate in those old style styrofoam cups. Egg burger + hot chocolate makes it a wonderful breakfast. Out of necessity & as a last resort, yes, but not because I’m missing a taste of home. No, I try to stay local as much as possible. There are so many options there’s no need to eat American fast food. Definitely. In Indonesia, almost everything is served with rice. And McD has fried chicken in their menu. I have yet to but I know that McDonald’s abroad always provide an interesting look. When traveling in Europe with our daughter, it works. She is adventurous but still needs her chicken nuggets and a kid’s meal once in awhile. I once ordered a salad at a McDonalds in France and added some fresh goat cheese that I had just bought at the farmer’s market. Along with a glass of wine from the menu and an outside table – a very nice lunch. McDonald’s in France to get a Royal w/ Cheese and was happy to find they also sold Beer. Nothing better than having late night McDonalds in a foreign country to give you a familiar feeling and the beer didnt hurt either. of course i would! esp being away for 5 months of the year.. any american food will suffice! Definitely! I think it’s interesting to see how McDonald’s adapts abroad. For the time I lived abroad for nearly 2 years, every now and then yes to remind me of my roots. Other than that, no. Yes! I always make a habit of trying McDonald’s in every country to see what different menu items they have. 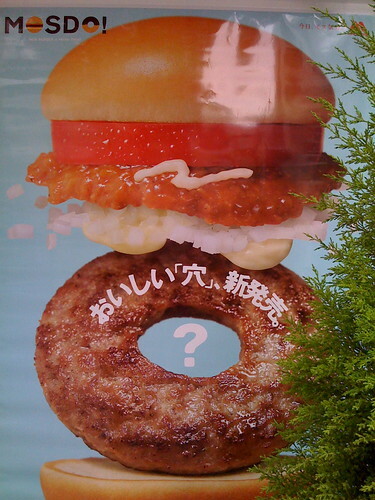 I love the shrimp burger in Japan! Yes, I have eaten a McDonalds cheeseburger and fries in Puerto Montt, Chile. It was the best McD cheeseburger I’ve ever had. I like giving the major fast food chains (i.e. McDonalds, KFC, etc.) a go while outside of the states just to try some of the many cultural differences in the menus. Those are always interesting experiences. I, sometimes, will also dare venture into an “American Cuisine” restaurant when outside of the states. Though truth be told… I don’t think any of those decisions have ever ended well. lol. I think for me, when traveling back to the states, my welcome back food is often either a Five Guys burger or an In-and-Out burger. heck yea i do. i love to try dishes that they dont have back home. Would definitely stop by for some “home cookin”. First choice would be either the golden arches or KFC. I have stopped at overseas American fastfood on several occasions – sometimes to see the cultural differences, sometimes because I’m in a big hurry and want fast and (mostly) inexpensive. Most notable – a McDonald’s Shamrock Shake while in Ireland during St. Patricks Day celebration and seeing (but not ordering) squid as a Pizza Hut topping in Singapore. Never! I don’t go to those places here in the USA. I think there are healthier and tastier options! I love trying American Fast Food outside of the US. I tried not to but I need to use their free wifi..
McD’s (breakfast only). And only in Tokyo. I get a kick out of mc d’s and the hard rock…though I never really go in. Is it strange that I get cravings for Japanese fast food greats like Yoshinoya gyu-don or Mr. Donut pon-de-rings when I’m it he US? I was in Oslo trying desperately to get some Scandinavian food for the entire trip and finding it exceedingly difficult. Everyone kept saying they only eat sandwiches at home and telling me to go to Italian restaurants! Both nights that we went out late with local friends we ended up at a packed McDonald’s after our overpriced drinks. Apparently the Norwegians love McDonald’s because its cheap and delicious. I enjoyed everyone one of those mcnuggets to the last crumb. That LAX BK only excelled at price gouging. I’d rather chill at Chilis. Not sure if that is still there, it has been awhile since I was in T4. I often eat at Mickey Ds overseas for the free wi-fI. In Argentina, the McDonals’s was a lot more expensive than what you could get at a regular restaurant so forget that. I did like the McDonald’s in India for their varied options… Although the fries were exactly the same as everywhere else. Always stop at KFC. It is way better in other countries! If I didn’t even go to McDonald’s while at home, why would I go to McDonald’s when I’m in a foreign country? In a pinch, rainy day, bathroom stop, free wifi or a quick snack.. yes! My favorite snack at McD’s in San is “café helado”. They put a generous amount of their ice cream in a small milkshake-size glass of coffee. YUM! I never eat fast food. When abroad I’d prefer to eat local cuisine. When in the US I prefer healthy foods. Though being a Chinese, I still love original recipes! Sometimes you just need a Starbucks. Yes, I have! They had free Wi-Fi 😉 And it’s exciting that I stand a chance to win a Gogo Inflight Wifi code! Absolutely! After 20 days of thai food sometimes you just need a break and McD does the trick! Would stop in one to see how the local flavors taste like. I stopped at McDonald’s at a rest stop on my way to Germany. I found it really interesting. They charged extra for more than 1 ketchup packet! Can’t recall exactly what country I was in. Yes, I like checking out the local menu items like taro pies at McDonald’s in shanghai. McDonald’s in Paris for a regular cup of coffee & free Internet access. Only if I’m short on time and only if the menu offered something different than what is available in the u.s. (eg porridge for breakfast at a McDonald’s in Bangkok). Always scout out Mackers not so much to eat but I have my picture taken in front of the sign. Always use HR for rest rooms and to add to our daughter’s pin collection. Best free wifi in WA in Mackers at Broome and a Big Mac was great after 16 days in the Outback. Who could resist a burger?! I have eaten at McDonalds in other countries when I tire of local food. Normally on longer trips. On long international trips I will occasionally visit an American chain to get a taste of home. Living in the USVI, where the only BurgerKing blew away in Hurricane Marilyn in 1995 I hit the nearest BK for a Whopper whenever I can. I’d never get a fried thing at McD’s regardless of country. It’s Whoppers that hit the spot. Depends what “American” food is near-by and where I am. If I can only find a McDonald’s, then no. But if I can find something decent, then possibly. Love me some McD’s when abroad. Don’t get me wrong, I enjoy experiencing new cultures and trying new foods, but it’s nice to get a little taste of home every once in a while.